The mangos at Costco have been looking particularly appealing as of late so I have been picking up a box fairly regularly. What do we do with 8 ripe mangos you ask? I make this salsa, we also like mango lassi (Indian drink), and then the kids go to town and can easily polish off the rest of the box of mangos within a couple of days. If I let them, they would eat all 8 in a day, but I get tired of cutting and peeling so we generally cut two a day when we have a Costco box. I have made this salsa three times since book club a couple of months ago, because we love it. 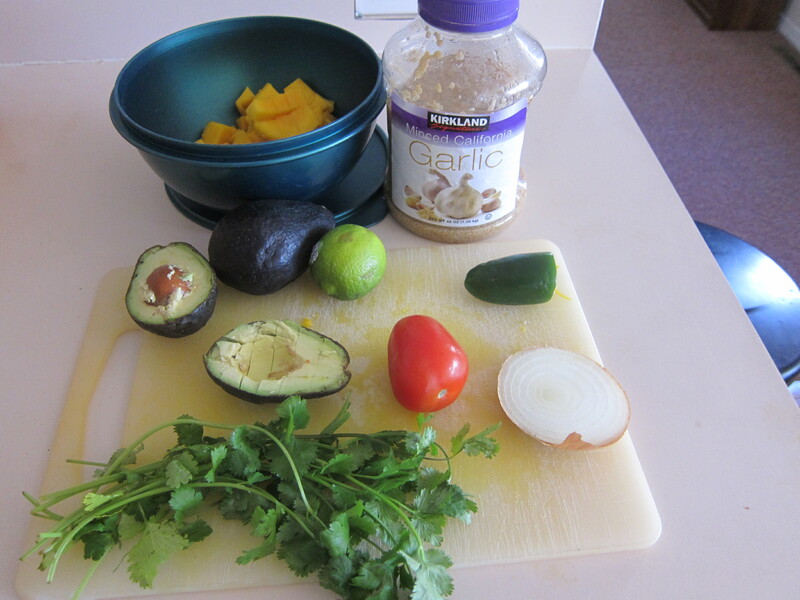 Here are the ingredients you will need: mango, 2 avocados, 1/2 a jalapeno, tomato, onion(I usually use red but had run out when I made this batch, but still tasted awesome with this sweet yellow onion), lime, garlic, cilantro and a little salt and pepper. Cutting a mango into cubes is pretty easy. Hold the mango upright on a cutting board, take your paring knife and slice down, as close to the stem as you can get. As you slice down you’ll feel where the pit is, and just go around it. Then you’ll do this again on the other side of the mango. You can slice off the two remaining , smaller sides as well but I don’t usually cube that part, I just give the skin to my kids and let them eat off the mango, or I’ll eat it myself :). Take your knife and cut the mango into cubes, then using a spoon, scoop out the cubed mango. Cube the avocados, chop the tomato and cilantro, dice the onion, garlic and jalapeno and toss them together in a mixing bowl. Squeeze in juice from one lime, add a little salt and pepper and then toss together and refrigerate. You can serve this as an appetizer with tortilla chips or on top of enchiladas or with any other Mexican dish. Enjoy!